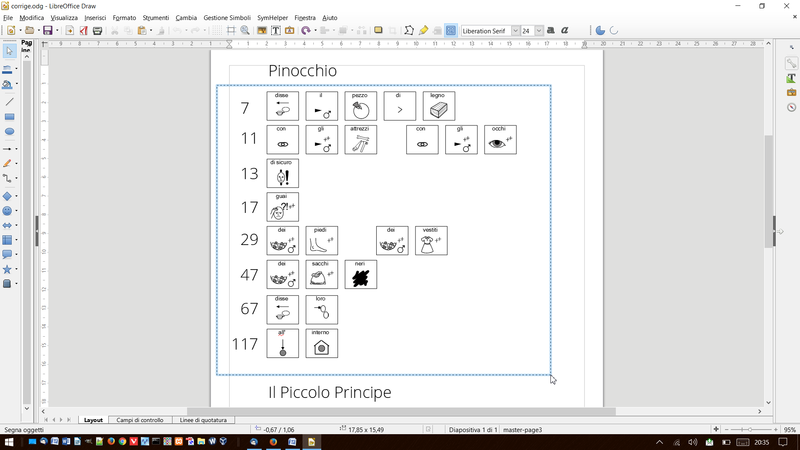 I am writing for a question about LibreOffice, which I promote as editing tool for symbol books, in conjunction with Widgit Symwriter. The problem aroused after the nasty forced update of Windows 10 to version 1703. Our process involves writing in symbols with Widgit Symwriter, print content to pdf and then open the pdf with libreoffice draw for post editing. A typical page can have a number of items in the order of 700. An important task to be performed, for post editing, is to select and move a portion or all of the boxes. Now this same operation is practically impossible, the time to select is infinite and infinite is the time to move selected objects with the directional arrows. I tried updating libreoffice to the current version, 5.4.2.2 and I also used the 64-bit version. Nothing. I've also updated java to version 8 144. Nothing. Can anyone tell me something about how to solve? Here is an example of typical content of the process described above.